Kingdom of Chaos: Purses make me ramble..
Daddy Chaos and I ran to the Dollar store last nite. I needed some snacks to send in for Southern Darlin' and also to fill up my Prize Drawer (more later). We did our shopping and looked like real winners.. A million little $1 tractors, cars and stickers.. Plus a few chewy sweet tarts (I get dibs on purple & pink) thrown into the cart. Junk. As we're checking out, I have my bag up on the counter. I recently switched over to my "fall" bag. It completely amuses me to say that because up until last year I had 1 purse that lasted 3yrs. Now, thanks to Cowie's bad influence and a sale I loved- I have purses to change each season. So when I bought this one I loved the pattern but it wasn't real summer-y. So anyway, my pretty purse is sitting up on the counter as I'm digging for my debit card. The cashier says "Ohh the lady before you had that same pattern." I immediately launched into my "Really? I just switched over to this pattern. It's getting chilly finally and Fall is here! Yay! Time to bring out the fall patterns." speech. Daddy Chaos rolled his eyes with the "why in the hell would the Dollar store cashier care about your stupid patterns." look.
" I just switched over to my 'fall' pattern too! I have been waiting all summer because I got this new pattern that's mostly blue and browns." Score!! Dudes, I got the random cashier to talk Vera with me.. In your face, Daddy Chaos!! He totally thought I was being all uppity talking about my expensive purses and the fact that I have more than one pattern and when the correct time to switch patterns is.. I walked out happy. I was all "See, she has Vera too.. She even told me her pattern colors. I'm not the only one excited to switch to the fall patterns. And THERE is such a thing as fall patterns." 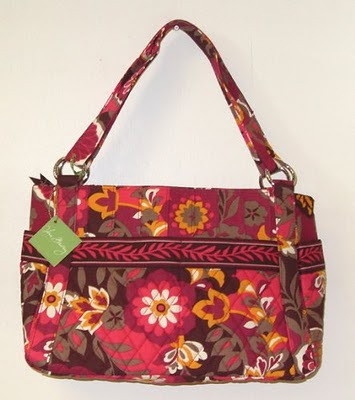 So, do you switch patterns or purses by season? If not and you really want to, I do still have a few Veras left over from my splurge at the sale last spring.. lol. LMAO, I just switched over to my fall bag this afternoon!!!! It's a dark red coach tote. It's also my winter bag, so I may switch it with a blue DB since blue is so big for fall. VERA!!!! I love Vera. My husband about fell out of his chair when I bought the Papricka pattern with matching wallet. I went into full cardiac arrest when I figured out that I splurged on the computer bag that's Vera too! I suppose it's easier to ask forgiveness than permission...$225 would've bought him a bunch of tools for work. I guess that's why I only get one once every 1.5 years.